Improved Mask of Eternity installer is highly recommended. Updated for compatibility with modern systems and pre-configured with nGlide. Comes bundled with King's Quest VII: The Princeless Bride. 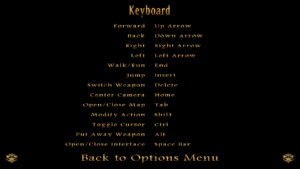 A custom installer for the game, it provides modern Windows compatibility, netbook support, improved load times, and various bug fixes. It can be found on the Sierra Help Pages Forums. 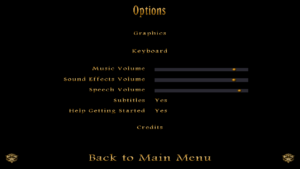 The King's Quest: Mask of Eternity - Shim is a run-time patch that has been developed to workaround the infamous TalkComplete bug (random cutscene freeze), a lot of compatibility issues, and some annoyances. All known demos, retail versions (English, French, Italian, German, Spanish, and Brazilian), and the GOG.com release have been tested on Windows 95..10 and Wine 1.8. Maximum native resolution available is 800x600. Use nGlide for higher resolutions (pillarboxed/stretched 4:3). 1. Download and install Zeckenseck's Glide Wrapper. 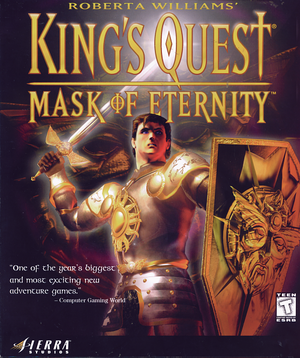 The King's Quest: Mask of Eternity CD was not found. Please check your CD drive and restart the game. You must be running in 256 color mode or higher. You can change the color depth from the control panel display icon. 3. Take the file created in Step 2 and add it to the installation folder. 4. While in the installation folder, open the Options.cs file with Notepad and replace line 8 to read assignGModeName Glide. 7. Start a new game! 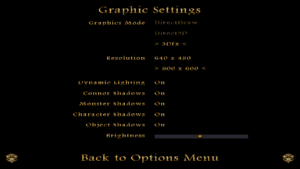 NOTE: If the above graphics settings work fine when launching a new game, try turning on graphics settings to improve the quality. This page was last edited on 31 March 2019, at 01:48.